TORONTO, Jan. 15, 2019 /CNW/ - Frontera Energy Corporation (TSX: FEC) ("Frontera" or the "Company") announces an operational update. All values in this news release and the Company's financial disclosures are in United States dollars, unless otherwise noted. Frontera delivered estimated 2018 production of 70,999 boe/d before royalties (63,180 boe/d after royalties), within the revised 2018 production guidance of 70,000 to 72,000 boe/d before royalties (63,000 to 65,000 boe/d after royalties). Subsequent to the Company providing updated guidance, pipeline disruptions shut down production in Peru on Block 192 during December 2018 and impacted annual production before royalties by approximately 875 bbl/d before royalties (745 bbl/d after royalties). Fourth quarter 2018 estimated production of 71,850 boe/d before royalties (63,835 boe/d after royalties), was 8.2% higher than production in the third quarter of 2018. Current production is approximately 72,000 boe/d before royalties (64,000 boe/d after royalties), following the completion of the Quifa SW water handling expansion project and strong production from the Candelilla-7 development well. Colombia production in the fourth quarter of 2018 averaged an estimated 62,923 boe/d before royalties (56,233 boe/d after royalties), an increase of 3.1% compared to the third quarter of 2018. During the first quarter of 2019, the Company plans to drill 27 development wells, including 23 in the Quifa area, four exploration wells (two at Sabanero, one at Jaspe and one at Mapache) and one water injection well at Copa-A Norte. At the Copa field, increased development drilling combined with increased water injection drilling in 2019 is expected to increase field level production from approximately 4,000 bbl/d currently to over 10,000 bbl/d by 2020. The completion of the Quifa SW water handling expansion project was completed on time and on budget, with current water disposal volumes of over 350,000 bbl/d resulting in an incremental 4,300 bbl/d of oil (approximately 2,600 bbl/d to Frontera), from 76 reactivated wells. Full water injection capacity to over 400,000 bbl/d is expected in the near-term as the final pump is commissioned. On December 2, 2018 the Company began drilling the Candelilla-7 development well on the Guatiquia block, which reached a total depth of 11,858 feet (11,669 feet TVD) on December 19, 2018. The well encountered 28 feet of net pay in the Mirador formation, 9 feet of net pay in the Guadalupe formation, and 56 feet of net pay in the Lower Sand-3 formation. The well was completed in the Lower Sand-3 formation with an electrical submersible pump. The Lower Sand-3 formation was flow tested for approximately 13 days at an average rate of 4,195 bbl/d of 43 degree API oil with an average water cut of 1% at stabilized bottomhole flowing pressure with a 5.9% drawdown. Current production is over 4,600 bbl/d under natural flow. There have been a total of 47,379 bbls of oil produced during the Lower Sand-3 testing period. The increased volume of high quality crude from Candelilla-7 will help reduce the need for the Company to purchase third party blends required to upgrade heavier grade oil production in other parts of the portfolio to meet pipeline specifications. On December 19, 2018 the Company was informed by the Agencia Nacional de Hidrocarburos (the "ANH") that the proposed expansion of the Coralillo exploitation area on the Guatiquia block was approved. 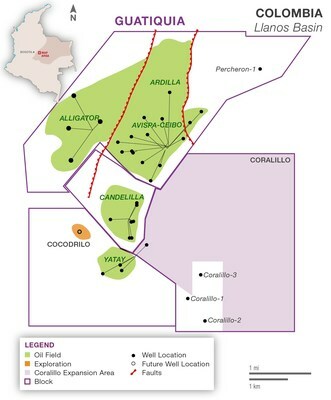 The expansion adds 1,383 hectares (approximately 3,400 acres) to the Coralillo exploitation area, for a total area of 1,571 hectares (approximately 3,880 acres). The expanded area will fully capture the potential Lower Sand-1 and Guadalupe pools discovered in the Coralillo-1 and Coralillo-3 exploration wells and allow for the drilling of between seven to nine development locations. The Company began drilling the Coralillo-2 development well on January 11, 2019. On December 7, 2018 the Company began drilling the Chaman-2D exploration well on the Sabanero block, which reached a total depth of 4,550 feet (3,348 feet TVD) on December 20, 2018. The well encountered 15 feet of net pay on rock, in the Basales formation. The well was completed in the Basales formation with an electrical submersible pump. The zone was flow tested for 7 days at an average rate of 107 bbl/d of 12.9 degree API oil with an average water cut of 85% at stabilized bottomhole flowing pressure of 1108 psi with a 10% drawdown. The testing was terminated. On January 5, 2019 the Company began drilling the Seje-1 exploration well on the Sabanero block targeting a separate structural closure from the Chaman-2D well. On December 13, 2018 the Company began drilling the Jaspe-7D exploration well on the Quifa Norte block in the Quifa area. The well was drilled to a total depth of 4,403 feet (3,515 feet TVD), in a down dip position and encountered non-commercial hydrocarbons and was abandoned. On January 10, 2019 the Company began drilling the Jaspe-8D exploration well on the Quifa Norte block in the Quifa area. The well was drilled to a total depth of 4,710 feet (3,437 feet TVD) on January 14, 2019. The well encountered 21 feet of net pay, oil on rock, in two zones of the Basales formation. The well is being cased for evaluation and testing. Peru production in the fourth quarter of 2018 averaged an estimated 8,926 bbl/d before royalties (7,603 bbl/d after royalties), an increase of 93.4% compared to the third quarter of 2018. Production from Block 192 in Peru remains shut in with the contract in force majeure as a result of community disputes relating to the NorPeruano pipeline in areas outside of Block 192. It is now expected that the contract relating to Block 192 will be extended to at least November 2019, from September 7, 2019 previously. Current production from Peru is approximately 930 bbl/d before royalties (790 bbl/d after royalties) which includes 150 bbl/d from Block 192 used for internal consumption. Peru production was estimated at 11,550 bbl/d before royalties (9,850 bbl/d after royalties) prior to the force majeure event on the NorPeruano pipeline in late November. As recently reported, progress continues to be made with respect to the finalization of a joint venture agreement with CGX Energy Inc. ("CGX" TSXV:OYL). A definitive rig agreement has been executed with ROWAN RIGS S.A R.L and CGX for the use of the Ralph Coffman offshore jack-up rig which is targeted to commence during the second quarter of 2019. All the required activity is being undertaken to ensure the Utakwaaka-1 exploration well will be drilled by November 27, 2019 to satisfy the contractual commitment. As at January 14, 2019 the Company has repurchased for cancellation 2,062,885 shares at an average cost of C$14.20 per share for a total of C$29.3 million ($22.2 million). A further 2,937,698 shares are available for repurchase under the terms of the amended Normal Course Issuer Bid. A dividend of C$0.33 per share is payable on January 17, 2019, to shareholders of record as of January 3, 2019. The dividend reinvestment plan was taken up by 23.8% of shareholders of the Company's outstanding shares as of the record date. The Company's dividend policy is to pay a quarterly dividend of approximately $12.5 million during periods in which Brent oil prices sustain an average price of $60/bbl or higher. The declaration and payment of any specific dividend, the actual amount, the declaration date, the record date, and the payment of each quarterly dividend will be subject to the discretion of the Board of Directors. The Company is pleased to announce that it will be hosting an investor and analyst day on Thursday February 7, 2019 from 8 a.m. until 4 p.m. in Bogota which will be webcast via the Company's website. Those wishing to participate in the webcast should pre-register for the event using the link on the Company's website www.fronteraenergy.ca. This news release contains forward-looking statements. All statements, other than statements of historical fact, that address activities, events or developments that the Company believes, expects or anticipates will or may occur in the future (including, without limitation, statements regarding estimates and/or assumptions in respect of expected production levels, development and drilling plans (including timing and projected production levels), timing and impact of facilities and infrastructure projects, the duration and impact of the force majeure on Block 192, statements regarding the Company's dividend policy and future payments) are forward-looking statements. These forward-looking statements reflect the current expectations or beliefs of the Company based on information currently available to the Company. Forward-looking statements are subject to a number of risks and uncertainties that may cause the actual results of the Company to differ materially from those discussed in the forward-looking statements, and even if such actual results are realized or substantially realized, there can be no assurance that they will have the expected consequences to, or effects on, the Company. Factors that could cause actual results or events to differ materially from current expectations include, among other things: production estimates and estimated economic return; uncertainties associated with estimating oil and natural gas reserves; failure to establish estimated resources or reserves; failure to meet projected timelines; failure to establish estimated resources or reserves; operating hazards and risks; volatility in market prices for oil and natural gas; the uncertainties involved in interpreting drilling results and other geological data; fluctuation in currency exchange rates; inflation; changes in equity markets; timing on receipt of government approvals; perceptions of the Company's prospects and the prospects of the oil and gas industry in Colombia and the other countries where the Company operates or has investments; and the other risks disclosed under the heading "Risk Factors" and elsewhere in the Company's annual information form dated March 27, 2018 filed on SEDAR at www.sedar.com. Any forward-looking statement speaks only as of the date on which it is made and, except as may be required by applicable securities laws, the Company disclaims any intent or obligation to update any forward-looking statement, whether as a result of new information, future events or results or otherwise. Although the Company believes that the assumptions inherent in the forward-looking statements are reasonable, forward-looking statements are not guarantees of future performance and accordingly undue reliance should not be put on such statements due to the inherent uncertainty therein.